Home > Shop By Brand > Menzerna Polishing Compounds > Menzerna PO 91E Intensive Polish 128 oz. Menzerna PO 91E Intensive Polish 128 oz. As close to a compound as you can get! Menzerna PO 91E Intensive Polish defies convention! Intensive Polish is capable of removing 2000 grit sanding scratches, oxidation, compounding swirls and other defects without hazing. Based on its abilities you’d think it’s a compound but, in fact, Menzerna PO 91E Intensive Polish is just what the name says – a polish on steroids! Menzerna PO 91E Intensive Polish leaves very little – if any – haze. The highly concentrated, small abrasives remove the paint flaw through consistent abrasive action. Compounds with large abrasives are practically scoring the paint surrounding the flaw, which causes dullness. The dullness then has to be polished out with smaller abrasives. Menzerna PO 91E Intensive Polish combines these two steps by gradually leveling the flaw with small, numerous abrasives that break down into a self-refining polish. The surface is left smooth, vibrant, and glossy. This is one of the most versatile and user-friendly polishes I have ever used. To call it a polish is somewhat misleading because it really falls somewhere between a strong swirl remover and a compound. Yet, it barely dusts and leaves no surface haze on most paints. You can apply it by hand to create a jaw-dropping gloss. Apply Menzerna PO 91E Intensive Polish with a Porter Cable 7424XP or a rotary buffer to remove swirls, oxidation, water spots, and most scratches. Your application method dictates how this polish performs! Use Menzerna PO 91E Intensive Polish on oxidized, dull paint, heavy water spots, swirls, and scratches. Even though the name says polish, by most standards, this is a compound. Menzerna PO 91E Intensive Polish can also be used on freshly repainted finishes (once cured) to remove overspray and imperfections. The formula is extremely low-dusting and contains no silicone, waxes, or fillers. It’s perfect for use in a body shop or paint shop. Clean up is quick and easy. 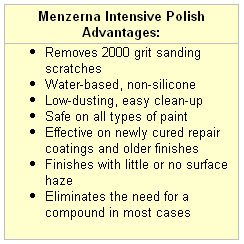 Menzerna PO 91E Intensive Polish will remove most paint flaws and, in most cases, you will not need to step up to Menzerna PowerGloss Compound. Create a high gloss, swirl-free finish with the polish acts like a compound. Menzerna PO 91E Intensive Polish removes moderate to severe paint imperfections with minimal or no loss of gloss and almost no dusting. Mist the Wolfgang German Polish N Wax Applicator with McKee's 37 Pad Conditioner to moisten the foam. Apply a nickel size amount of Menzerna PO 91E Intensive Polish to the applicator. 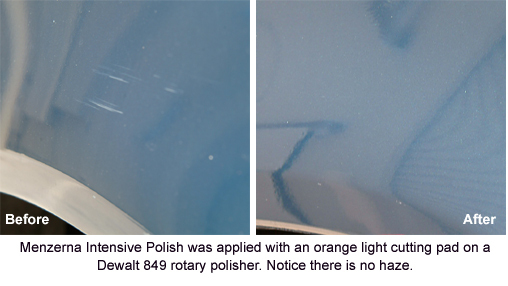 Note: Applying Menzerna PO 91E Intensive Polish by hand will enhance gloss but it will not remove swirls or scratches. For paint correction, you must apply this product with a polisher. Make sure the surface to be compounded is clean and dry. Fresh paint should be fully cured. Apply Intensive Polish out of direct sunlight. Use a wool or foam polishing pad, like Lake Country’s CCS White Polishing Pad or The Edge’s Blue Pad. Apply a 6 inch line of compound to the vehicle. With the polisher turned off, spread the polish over about a 2 x 2 sq. ft. area. Polish at 1200-1800 RPM (5000-6000 OPM on a dual action polisher) working slowly across and then up and down the area. Check your work after several passes to see if the defect has been removed. If so, reduce the pressure and continue buffing until a high gloss is achieved. If the pad becomes dry, mist it with water and continue buffing. Menzerna PO 91E Intensive Polish 32 oz.